Arab Revolutions : A March from WikiProtests to WikiConsciousness? Ben Ali was made to flee Tunisia when his regime failed to still the voices of dissent of Tunisian people. Mubarak has been dethroned in Egypt after weeks of protests throughout the country with its fulcrum at Tahrir square. Two hated heads of regime have fallen, and these events have shaken the foundations of other repressive regimes in the Arab world and even elsewhere. But even though Heads have rolled the Body of the regimes remains intact. People there have earned a well-deserved victory, but this is just a beginning on the long road to achieving true people’s democracy. This may sound like an unwelcome dampener in the general mood of celebratory euphoria, but a realistic assessment is a must to guard against the stealing of this revolution. Revolution it is, and has some extraordinary features rarely seen before. Here is a movement where people were leading, and formal political or religious formations had no role to play or at best were followers. A woman, Asma Mahfouz, who began as a political activist in 2008, has reputedly acted as a trigger that launched the mass movement. She uploaded a Youtube video in Mid-January urging all “all young men and women to leave their computer screens and converge on the streets of Egypt to protest the brutal and corrupt rule of the 82-year old Mubarak”. “I am a woman and I am going out on Jan. 25 and am not afraid of the police. For the men who brag of their toughness, why exactly are you not joining us to go out and demonstrate?” Asma, who had only one name just a few weeks ago, reports Emad Mekay, has now at least three more : “A woman worth 100 men”, “The girl who crushed Mubarak”, & “The leader of the Egyptian revolution”. Mekay adds, “Women have visibly been in the forefront in demonstrations at Tahrir Square and other places – in a society where women traditionally have taken a back seat”. What Asma started was later energised by an unlikely man, an Egyptian working in UAE for Google as head of marketing, Wael Said Abbas Ghonim, who asked his employer to allow him to return to Egypt in the last week of January, and then disappeared on 27th January, only to come back 11 days later after his release from incarceration by Egyptian regime. His emotional interview on the day of the release ended with a sentence, “Egypt above All”, which truly characterises this mass uprising. Even though this was a spontaneous uprising with no organized effort behind it, the discipline of the people, the spirit of camaraderie, and absence of violence (whatever violence was there was inflicted by the State, which in any case arrogates the monopoly over it) were its remarkable features. Third wonderful feature was the self-organizing capability showed by the masses leveraging technology; like the Wikipedia of the cyber space, this was the WikiProtest of the masses. When regime panicked and blocked the internet access, the people resorted to Twitter to stay in touch, plan, and keep the spirits from flagging. Here are few of the things Ghonim said on CBS’s 60 minutes. “I removed my blindfold and I said, ‘Hi,’ and kissed every one of them.All of the soldiers.And, you know, it was good.I was sending them a message”.“It (beating) was individual based, like, and it was not from the officers. It was actually from the soldiers. And I forgive them, I have to say. I forgive them, because one thing is that they were convinced that I was harming the country. I’m sort of like a traitor, I’m destabilising the country. So when he hits me, he doesn’t hit me because… he’s a bad guy. He’s hitting me because he thinks he’s a good guy”. People of Egypt have tasted the power of mass action. They won’t be same again. Egypt will not be same again. Yet dangers lurk, and they will be overcome only through raising the consciousness of the people about the true nature of things. WikiProtests now sorely need WikiConsciousness. Mubarak is not regime. He is merely a symptom, a face of the regime. When he was in power, he embodied the system that Egyptians found so insufferable. When he was forced out, the regime was humiliated, but not defeated. The system that made Mubarak is still intact. A change of face is not dismantling of regime. A lot of work lies ahead. Army didn’t interfere or take overt stance during the protests. 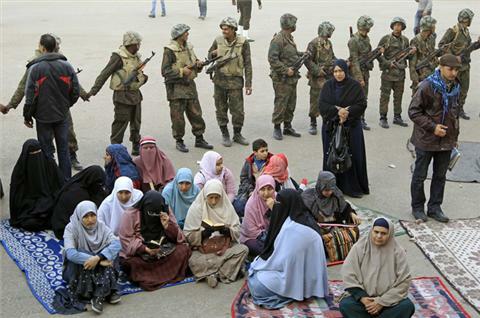 One cannot overlook that the very same army had been the bulwark of Egyptian regime for some three decades. Can instrument of repression have a change of heart & character in under 3 weeks? Unlikely! Did the army echelons fear mutiny among the ranks were the protests crushed in a bloodbath? 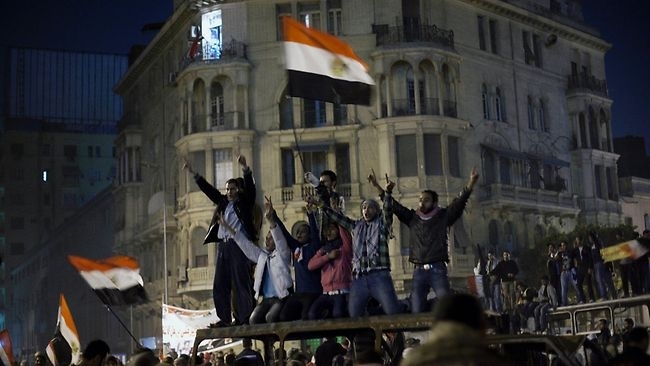 Over three hundred people were killed by the Police and hoodlums of Mubarak, yet the protests continued unabated. One would never know the answer to that question. Probably, the ruling elite realized that the time had come for Mubarak to go; it was small price to pay for the continuation of the system. Whether sacrifice of Mubarak will leave the ruling arrangements intact or not will depend upon how the people plan their next mass actions. But without their vigilant participation and mounting of relentless pressure on the regime, the plans for return to “business as usual” are likely to succeed. There are many signs of behind the scene activity to hasten Mubarak’s departure and to avoid the rocking of the boat. Leon Panetta, Director of CIA, announced citing “credible intelligence” that Mubarak will be stepping down in a few hours. But Mubarak that evening in a televised address vowed to stay on in the “larger interest of Egypt”. His speech galvanised the already spectacular mass protests to up the ante. His show of “defiance” ended in under 24 hours. Was the “show” orchestrated just to “show” there were not any external forces at work, such as US pressure? Most likely this is the only rational explanation. The power was handed over to the Supreme Council of Armed Forces (SCAF), may be because it was perceived as “Honest Broker”, and would be acceptable to people as an interim measure to signal complete “break” from the past. This stratagem seems to have worked for the time being. SCAF has dissolved the parliament, suspended the constitution, announced that a panel will be formed to amend the constitution before putting it up for popular referendum and that it will honour all international treaties and obligations (including the peace treaty with Israel singed in 1979 at the behest of USA), and would stay in charge of the country for six months until the next government is formed. However, one key demand of the protesters, repeal of the emergency laws that have been in place ever since Mubarak assumed power in 1979; and lifting the 30 years long state of emergency, is unmet. Luckily, some protesters have seen through the subterfuge and have decided to continue the agitation until the repeal of emergency laws and handing of power to civilian government. Early on last Sunday this has led to scuffles between the army out to clear the Tehrir square and restore “stability” and “normalcy”; and the protestors who want to stay on for what they see as unfinished business. Would this be a flashpoint for further agitations? One cannot say anything with certainty. But other discontents too have been uncorked in the process : employees at two public sector banks struck work and about 2000 police demonstrated in front of the interior ministry, both for better pay, just like the strikes declared by workers in the industrial units. Expectations of return to “Business as Usual” in Egypt were unusually strong the day after Mubarak stepped down than anytime during the clueless uncertainty surrounding the 18 days of mass agitation. The latter state was described by one TV commentator as Obama administration “falling behind the curve” – a double speak for inability to “manage the events” overtly or covertly. Stock markets the world over rebounded after SCAF took over control in Egypt heralding, in that case, the arrival of US administration ahead of the curve. On one hand Obama said, “The people of Egypt have spoken – their voices have been heard and Egypt will never be the same”; on the other he praised, “The military for serving responsibly to preserve the state”. Here preservation of State alludes to preserving the present money and power arrangements. Other world leaders too are appreciative of the “change”. David Cameron said, “Egypt now has a really precious moment of opportunity to have a government that can bring the country together” – stress is on stability and continuity. “Mubarak’s decision to step down is courageous and necessary”, crowed Nicolas Sarkozy – after over 300 lives were lost; and exemplary courage & defiance was shown by the people of Egypt. Russia’s Sergei Lavrov hoped that “Power shift will result in stability”. Even Jacob Zuma of African National Congress, which fought a bitter & long drawn struggle against apartheid, declared that Mubarak, “having thought like a leader, to place the interests of Egypt above his own, and taken the correct decision to leave”. This sounds like unwitting affirmation of the fact that ANC has sold the interests and aspirations of the blacks to the establishment in South Africa. Israel initially responded by saying, “…too important to draw immediate conclusions about the outcome”; but once the SCAF announced in its communiqué 4 that it will respect the Egypt-Israel peace treaty, Netanyahu’s office welcomed it by saying, “the longstanding peace treaty between Israel and Egypt has greatly contributed to both countries and is the cornerstone for peace and stability in the entire Middle East”. Taking over of power by Egyptian army has been welcomed by world leaders because USA has strong linkages with it and aids it with an annual assistance which now amounts to some US$ 1.30 billion. It was reported that “U.S. Defense Secretary Robert Gates was in even closer contact than usual with Tantawi, in an apparent effort to ensure that the military – which initially stood by without reacting – would ensure an end to violence against protesters perpetrated mainly by Egyptian police and “baltagiya” (thugs, many of whom were hired by the ruling party), that had caused the deaths of more than 300 unarmed Egyptian civilians and injuries to thousands”. It would be interesting to contrast here the way the Western Europe and USA embraced the prodemocracy movements that shook the Eastern Europe in 1989 with the display of “anxiety” at and paying off at best “lip service” to the democratic urges spreading rapidly throughout the Middle East today. What prompts such duality? The answer is obvious. East Europeans were fighting against the Communists regimes and Soviet hegemony; and were therefore pro-West. The disquiet in the Middle East on the other hand is directed against the very regimes, which have had cosy working relationships with USA, Israel, and the West. The regimes that ensure the uninterrupted flow of oil to the West while enriching themselves and mortgaging the welfare of its own citizens. Just to cite one case: Mubarak’s family fortune is estimated at USD 70 Billion, something like over US$ 2 billion a year for his 30 years’ rule. The regime, which robbed the Egyptian people, was a “moderating”, “stabilising”, and “secular” force in the “troubled” Middle East region; that is if one is to believe the West and Western Mainstream media. In fact, Egyptians may test the “transparency” and “rule of law”, which all Western Democracies avowedly profess, by calling on them to confiscate the moveable and immovable assets of Mubarak family and returning them to the rightful owner – the people of Egypt. Though such credible threats are there that would attempt to steal the revolution, there are promising shoots of hope too. For one, the democratic upsurge is spreading across the region not respecting national boundaries. 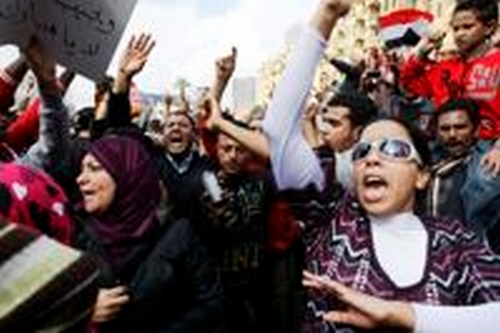 Protesters are on the march in Algeria, Yemen, Bahrain, and even in Non-Arab Iran. This Pan-Arab mood for democracy is likely to feed each other with inspiration, ideas, issues, and may eventually ratchet up relentless pressure until the system is overhauled bottoms up. Even in Egypt, 4 days after the departure of Mubarak, some 2000 resolute demonstrators again assembled in Tahrir square to demand immediate repeal of emergency laws. Army wants protests to end, strikes to discontinue, and “stability” and “security” restored. It said, “Noble Egyptians see that these strikes, at this delicate time, lead to negative result”. Obviously, sufficiently large number of people has seen through the game of pacifying the unrest and of stilling the exuberant energies of people by buying time. The most promising feature of these uprisings is the role played by women. Just as Roxanne Farmanfarmaian writes in “Arab Revolutions transcend Iran’s”: “….And in Cairo and Amman, the women and men, boys and girls are marching side-by-side, calling for the right to vote, empowerment and human rights. For anyone willing to read the message, the writing is on the wall – the Arabs are marching because they wish for transparency, employment and the right to be heard. These are the voices of people who no longer fear the slogans that, if it’s not dictatorship, its Islamic extremism. They, much more than any Western observer, are aware that Islamic extremism, sharia and religious governance are as stifling as any other form of authoritarianism”. This promise holds the hope for the future.